The story started with a simple research presentation. Suhas Pol, a research assistant professor in the Department of Mechanical Engineering at Texas Tech University, asked Kerry Gilbert, professor and director of the Clinical Research Anatomy Laboratory, at the Texas Tech University Health Sciences Center (TTUHSC), to give a presentation related to fluid dynamics of nerve tissue. During the presentation, Gilbert mentioned a research problem that caught Pol’s attention. Gilbert and his colleagues Phillip Sizer, professor and director of the Musculoskeletal Research Laboratory at TTUHSC, and Richard Ellis, senior lecturer at Auckland University of Technology in New Zealand, wanted to measure and predict tissue kinematics or the amount of displacement and strain on nerve tissue in live patients. The ability to measure and predict strain in nerve, muscle, tendon and ligament tissue would help physicians and physical therapists examine, prescribe and monitor treatment outcomes for people with compromised tissues. Unfortunately, the currently existing methods for accurately measuring tissue kinematics are relatively invasive, making them impractical for clinical applications. Pol said his department had an experimental tool, originally used for wind energy research, that he believed could be applied to research on tissue. After developing and applying the technology for two years, Pol and the rest of the team realized that the process had commercial potential. While Gilbert and Ellis continued with the initial research efforts, Sizer and Pol worked diligently to develop the disclosure document. The Office of Research Commercialization encouraged the researchers to enter the National Science Foundation’s Regional I-Corps program, hosted at Texas Tech’s Innovation Hub at Research Park. The program is a national initiative that helps researchers identify paths to taking their inventions and discoveries to the marketplace. Because Pol had been through the I-Corps program at the national level for other technologies, he knew the program would enable the team to understand whether the technology that was designed for research had commercial value. As part of the program participants develop business plans and conduct interviews to identify potential markets. At this point, the research team included an entrepreneurial lead, Kinyata Cooper, a doctoral student in the TTUHSC Rehabilitation Sciences Program. Over three weeks, the team interviewed 29 professionals from a variety of fields and cities. The purpose of these interviews was not to describe the technology in order to see whether people wanted to buy it. Instead, interviewers sought to understand the problems that people in other fields face and recognize how or whether the technology in question provides a solution to that distinct problem. Although the technology offered value to many clinical fields, the researchers had not predicted one of area of medicine that seemed to have the greatest need for the technology, Sizer said. Obstetrics and gynecology (OB-GYN) specialists were particularly interested in using the technology to measure scar tissue following a caesarean section. This assessment tool may provide OB-GYN specialists to more accurately determine the risk associated with future natural child births and limit the number of emergency caesarean section surgeries necessary. 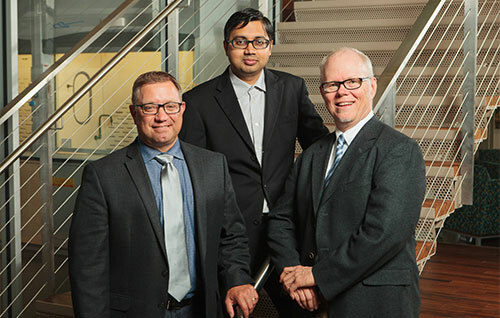 Although commercialization was not the team’s original plan, they said they would encourage fellow researchers to participate in the I-CORPS program. “Going through the process slows things down a bit, but the end result is dramatically different than what you would have otherwise imagined,” Gilbert said. Feature image: The Office of Research Commercialization encouraged the researchers to enter the National Science Foundation’s Regional I-Corps program, hosted at Texas Tech’s Innovation Hub at Research Park.